We see a lot of people in our social media course who are on Linkedin, but in name only. Literally. They’ve set up an account, put their name on there, maybe their job title and company, some scant info, and that’s about it. They know they should be doing more and suspect they can get more out of Linkedin, but the whole thing is a bit of mystery and besides, where to start? If this might just be you too, you’ll find this Linkedin Beginner’s Guide useful. In it, I’ve identified practical, actionable things you can do to get Linkedin up and running, and working for you. And yes, that suspicion Linkedin is important is right. At the time of writing this post, there are 6 million people in Australian on it. That’s about half of the number of people working in the country. Worldwide there are 400+ million on Linkedin, with 2 new members joining every second. As opposed other social media, it’s clearly focused on business and professional purposes. It can help you uncover new business, find a new job, prepare for a meeting, and give your online reputation a major shot in the arm. It’s significant and worth getting right. Let’s dive in and see what you can do. Set aside an hour or two at night or on the weekend. Log in to Linkedin, explore the different sections, see what they do, and most importantly start filling in sections. You won’t get it 100% right first go, but you will make a big leap, not only in how your Linkedin looks but also better understanding how it works. Don’t be shy, put your best foot forward. Think of it like a job interview or a prospective client considering you for the business. What are your major achievements? What sets you apart? Linkedin runs on the words you put in there. Good, well-crafted content will help you get found and give others confidence to work with you. If people find not much at all when they land on your profile, it doesn’t really do you a whole lot of good. That’s the pep talk, now let’s get into it. Action is key, but before you start it’s important to have a direction. What are your career goals? What do you want to known for? Being clear on where you’re heading will help you fill in your Linkedin profile, decide who to connect with, make better use of Linkedin’s features, and create content to post. Importantly too, it will help you be clear on the most fundamental aspect of Linkedin: the words and language that describe your work. Also known as your ‘keywords’. Keywords help you get found on Linkedin. Yours should describe: what you do (the field you work in and your skills), who you help (the kind of people they are), and where you work. To give you an example, my field is ‘social media’. But you can, and I have, used related terms such as ‘digital media’ and ‘internet marketing’. On the skill side, its’ ‘training’. But there are related words of ‘teaching’, ‘classes’, ‘courses’, ‘trainer’ and ‘educator’. The people I help include marketing professionals, small businesses, causes and startups. And I mostly work in Sydney, in the Eastern Suburbs. If you look closely you’ll see I’ve peppered these words in my profile. As you write your own profile be aware of what you want to be known for and use those words. Don’t overdo it, though. Avoid “keyword stuffing” as they say. Your Linkedin profile needs to read well for humans, not just Linkedin’s algorithms. Authenticity is still paramount. You can then put this simple web address as an email signature, on your business card, in your resume, and as the website where you want people to know your credentials. A simpler url also nudges the search engines to find you. To do it, go to www.linkedin.com/profile/public-profile-settings. In the top right you’ll see ‘Your public profile URL’. If your name is Jane Smith, it’s probably already taken. In which case I’d advise including your middle name. There’s a guy called David Scott who did that. He’s stuck with his unusual middle name (Meerman) across everything online to differentiate himself and done pretty well. There’s a number of sections to fill out in your profile, but the one that’s most important is the ‘headline’. Your headline tells people who you are and what you do. It’s a chance to stand out and attract people who are good connections and possible leads for work. Most of the time on Linkedin when you see other people on there – e.g. in your news-stream – you’ll see their name, their photo, and their headline. It’s a simple snapshot of who they are. Like the headline for an article or an ad, yours should sum things up and draw people to you. The other big thing you need to do is include your critical keywords in it. To change or write your headline, go to Profile, click on edit profile and then the little pencil icon. The other associated info you’ll see just underneath your headline is where you’re located and what industry you work in. These are simple items to fill out, but also critical to your visibility in Linkedin. Make sure you do them. There’s only a little button for this on your profile page, so many people overlook it. However, it’s a chance to get your email and phone number on there. Only people connected with you can see your email and phone. If you’re doing a good job of branding yourself and selling your services it means your connections can reach you. In the same area, you can also add your website(s) and Twitter account(s). Worth hooking up if you have them. This helps people find out more about you and boost your branding. One of the goals of your Linkedin profile is to build credibility. A blank (ghost) photo is not a good look. It’s also a fact that Linkedin members with a photo get 11 times more profile views on average. Again, no need to be shy. This is about building the brand of you. What sort of pic should you put on? A head and shoulders shot is best – as it’s going to be small on the screen and you want people to recognise you. On that note, it’s also a good idea to use the same pic across your other social media. Does it need to be photographed professionally? No, not necessarily. It could be a simple shot against a blank background or even a selfie. Just make sure it says this is a professional person. A snap from your holiday in Bali is not a good idea. A background pic will make your profile look more professional and more interesting. Go for a photo that represents you and your field. And try to make it interesting or striking. If you don’t have a photo for it, you could go to a photo stock library and pay a little (between $10 and $60) to buy one. There are heaps of libraries out there if you google it. Some big ones are iStockphoto and Shutterstock. The tricky part with libraries is finding a shot (you only need one) that’s not cheesy or cliched. There’s some alternatives in this article and my collection of stock photo sites. Your Summary is the first real impression people will get of you, after your photo and headline. This is a place where you can speak to the reader in a human voice and give them a feel for who you are. A good way to do that is to tell your story: where you’ve been (your past successes) and where you’re going. And don’t just think about you, think about who you help and how you help them. How long should your Summary be? It’s a juggling act. Of course, a lot of people scan text online and don’t read much, but then some will want to know more if they’re considering trusting you (to buy from) or investing in you (to employ.) People also will read more if it’s well written. There’s a lot of people on Linkedin who sound like shiny robots. They flood their text with glowing adjectives and overdo the jargon. For each job in the ‘Experience’ section, the key things are the company name, job title, location, period and job description. 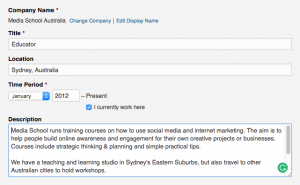 If your organisation has a Company Page on Linkedin, it should come up as you type. Once saved, it’ll give you a link to more info about the Company on your profile. Again, it’s worth pointing out you need to nail the keywords in your job title and you need to make sure you have the location in there – to make your profile findable. You really should fill in a good amount of your work history in the ‘Experience’ section. That includes the Description bit. It gives you depth and it’s a place to enter more of your keywords. When you’re starting with a blank screen this might seem a lot to do. One simple way to get things going is to dig out your CV and draw from there. You could copy and paste from CV, but I’d suggest you also edit and tweak it to make it read well. You can add media to your text. It can be a document, photo, link, video, or presentation. This “rich content” brings your work to life and makes your profile more interesting and convincing. You’ll see the buttons for it at the bottom of the job position. You can pick up a link of a presentation from Sildeshare or a video from YouTube or Vimeo and it’ll appear in your profile with a visual. On your Linkedin profile (under Experience but near the top) you’ll see coloured squares identifying other sections. Click on ‘View More’ to find more sections and then start adding your info. The purpose of adding more about you here is that it rounds out your profile and adds to ‘substance’ to upur profile – proof you can do what you say you can. They’re also another chance to put in keywords which will help you get found. There’s a bunch of sections available, but the ones I’d suggest you consider / have a go at are: ‘Courses’, ‘Volunteering’, ‘Organisations’, ‘Honours & Awards’, ‘Projects’, and ‘Certifications’. Note that ‘Courses’ are short courses you’ve done with training providers, whereas ‘Education’ is more like your Secondary and Tertiary Education at larger institutions. Skills is another area where you can highlight your strengths and insert keywords. Your Connections can then endorse you for your skills. It’s slightly controversial this one. Yes, it’s very easy to others to endorse you and you them. But it does say something if you’ve got a 50 or 100 people saying you’re good in particular area. To get it going, find the Skills coloured square, click Add Skill and fill it out. You can submit 50, but best not to overdo it. 20 is ok. Your connections can also add skills you may not have thought of. You can re-order skills or delete them. On the flip side, you can endorse your Connections. Find their profile and click on Endorse. Or scroll down to their Skills and click on the + button next to the skill. Make it a genuine endorsement for someone you genuinely admire. Start with friends, family, work colleagues, and clients. Put their name in the search box. Alternatively, put the name of their business in the search box to find them. ‘1st’, ‘2nd’, ‘3rd’ against people’s names show how many degrees of connections away they are. For 2nd degree connections Linkedin shows who you know in common. You’ll see in the top left in the navigation bar a little figure of a head. Hover over it with your mouse and it’ll show ‘Pending invitations’ and ‘People you may know’. ‘Pending invitations’ are people who’ve reached out to connect with you. There may be people there you know and want to connect with. Same for ‘People you may know’. Scan through and connect. This starts to work better once you’ve inputted where you’ve worked and built your connections. Sometimes I meet people at a business function or a meeting or a seminar that are doing interesting things work wise. In the old days, I might have got a business card, taken it home and shoved it in a desk drawer. This is a quick way to increase your network on Linkedin. You can send a bulk invitation to people you’ve interacted with on email. Hover over ‘Network’ in the navigation bar at the top and click on ‘Add connections’. Once put your email in it’ll pull up a stack of people. Don’t send an invitation request to everyone. Tick people who know you. Once it’s imported, Linkedin will identify which of those contacts who are on Linkedin. And similar to how it does with email (above), it will ask who you want to connect with. Again, you shouldn’t overdo it and send invitation requests to everyone. Choose people you have a reasonable relationship with. This can be another fast way to build your connections. And connections are key to Linkedin. It can be worth connecting with people who are a good contact in your field &/or where you have something strong in common. This applies to people inviting you to connect (‘pending invitations’) and for you reaching out and building your network. If you’re going to reach out to people, though, you need to make sure your profile is solid and credible for a start. Also that there might be mutual benefit down the track. And that it won’t be seen as pestering them. Willy nilly connecting (which happens a lot on Linkedin) is not a good idea. There are 6 million people in Australia on Linkedin and more inputting information about themselves. Linkedin’s search function allows to tap into that and find people in your field. If you’re looking for a job you can find other people with that job title and learn about their career pathway. You can find companies you’re interested in, learn who works there and what’s happening with them. You may even be able to track down who’s likely to do the hiring in the Company. If you’re chasing sales leads you can specify typical job titles of your prospects and your industry. Once you’ve found prospects Linkedin shows if you know anyone in common. Next to the Search box at the top on the right-hand side you’ll see ‘Advanced Search’. If you click on it, you’ll see your options for refining your search – by keywords, title, company, and location. On the left-hand side of the Search box you have options to search by People, Jobs, Companies, Groups, Universities, and Posts. Check out this article on Linkedin Search to go from beginner to more advanced use of search. Before you send a connection request it’s best to click through to their profile and connect from there. Reason being that you can wrire a personal note with the request. After you click the ‘connect’ button on their profile you’ll get Linkedin’s default “boilerplate” text inviting them to connect. You can, and should, tweak the standard text to personalise it and make it more human. Include their name and write how they know you or mention where you met them. Find something in common. You can review how you’ve been writing to people at www.linkedin.com/messaging. A Recommendation is like a testimonial. It’s proof you’ve got the goods and helps build trust. The best way to get a Recommendation is to write one first for someone you’ve worked with. Once you’ve done it, Linkedin will ask them if they want to write one back. To get started go to www.linkedin.com/recs. You’ll see there you can also ask your connections for a Recommendation. Who do you ask for a recommendation? You should balance close contacts, people you know were impressed with your work, and people who look good (title wise.) Not everyone you ask will write a recommendation for you. Of course, it helps to ask people you got on with well. Help the people you ask. Prod them with what they could write about. Give them some thought starters. Once you’ve been given a Recommendation you can choose whether or not to show it. You can also move those recommendations up or down on your profile. 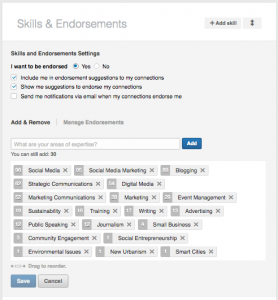 Linkedin will use your skills, location and other info you’ve inputted to suggest jobs to you. You can also search for a job. The advanced search gives you options to search by industry, job function, and location. Once you click on a job you’ll see: who posted the job, where to apply (which can be via Linkedin), desired skills and experience, the number of applicants for the job, more about the Company, and similar jobs. If you’re looking for staff for your business you can also post a job. Before a meeting and or an interview you can use Linkedin to find out more about the person you’re meeting and their company. If they’re on Linkedin you can research the organisation’s services, culture and news. You can find out more about the background and career paths of the people who work there, including the person you’re meeting. You may even have things in common with them – connections, groups or education. A mutual connection might be able to give you an inside scoop or let you know where to find more info. You can also research the industry via industry groups on Linkedin. Company and industry knowledge is often a important element in landing a job or new business. There’s a group on almost possible niche you can think of on Linkedin. To find a group, use the Search box at the top and then the Groups filter on the left hand side. To get to the Groups section of Linkedin go to www.linkedin.com/groups Otherwise hover over Interests in the navigation bar and drop down to Groups. Use Linkedin’s Search box to find and follow companies you’re interested in. They might be organisations you either want to do business with or get a job at. If you explore their Company page you’ll be able to see who works there, the kind of roles and job titles they have, their products and services, and the latest on what’s happening with the Company. In fact, if you hit the follow button their updates will go into the newsfeed. You’re welcome to check out and follow Media School’s Linkedin Company page. Bonus tip: if there’s magazines that produce useful articles in your field, find them in Companies and follow them. It can be a useful source of news to keep you up to date and source articles to share on social media. A Linkedin Company page can help lift your business’s credibility. On the page itself, you can provide more info about the business to prospective customers, including what you do and why you do it. You can create a Showcase page about aspects or products in your business and you can identify staff who deal with particular products. In your updates, you can let followers know about news and provide content and ideas that will help them with their own work. (So the page becomes one of the tools in your content marketing.) That can include blog posts, videos, web links, and special offers. And you can post job opportunities at your business. Your page comes with analytics so you can see what posts by the business work best. Once you’ve set up your page it’s a good idea to get staff to follow the Company page and share updates on Linkedin. You must have a business email to set up a Company page. Back to your personal Linkedin. 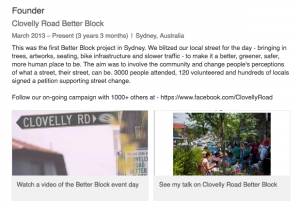 On your Home page near the top you’ll see options to “Share an update”, “Upload a photo” or “Publish a post”. When you put info in here it goes into the news-stream of the people you’re connected with. This is where you can build your personal brand by carefully posting content that’s useful to your network. It could be a blog post you’ve written or a post by someone else or an article you’ve found. It could be a video. It could be a presentation you’ve done (and posted on Slideshare) or your newsletter (on a platform called Issuu.) It might be an interesting event that’s coming up. If you’re stuck on something you could ask a question of your network. You could ask for an introduction or a referral to a company you’re interested in. Some important tips for you. Remember this is about business. The goal is to build credibility and your professional brand. Make it relevant and helpful. Be careful about being too self-promotional. And some other useful tips: photos and videos tend to get more interaction on all social media (including Linkedin.) Questions get interaction. Liking, sharing and commenting on others posts helps them and gets your name in front of them. Posting good content on a regular basis is how you build credibility. You can write your own article on Linkedin’s publishing platform (known as ‘Pulse’.) It’s more than a status update, it’s more like a blog. You can format the post and add images. The idea of doing this is that it showcases your expertise and helps build credibility. It contributes to people’s first impression when they look at your profile – as these posts sit at the top of your profile and can be read by anyone. The post also pops up as a message in the notifications box of your connections. And it goes into Linkedin’s big Pulse collection. People can then follow you if they like your work. Non-Linkedin users can also read Publisher posts, unlike your normal status updates. You also get stats on your posts to see how you’re going and what kind of people are reading them. If you Google search a person’s name, you’ll often find a Linkedin profile or two comes up on page one of the search results. Actually, try it for your own name and see. If you’ve made a start on Linkedin your profile could well be on there. 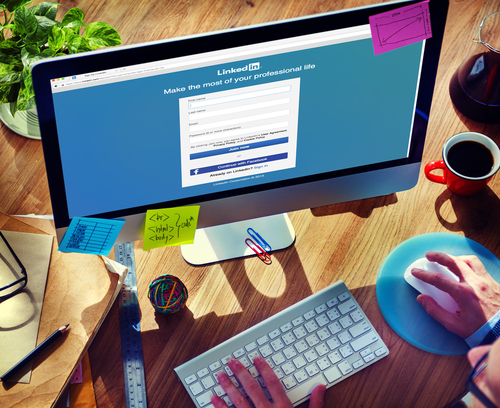 Some newbies run scared of this, but the thing is that you can control your Linkedin profile. You can’t necessarily control other results about you. On Linkedin you can put your best foot forward and position yourself in the best possible light – via the info you put in the different sections of Linkedin. You can even decide to show some info for people on Linkedin, but turn it off for the public searching on Google. In the ‘public profile settings’ page, you can tick or untick what you want to show to the public. “You’re the boss of your account” is the latest slogan from Linkedin themselves. If you end up making a big dent on the work here, you’ll be well and truly on your way. If you want to make your profile really hum though, you need to come back to it, re-read it and re-work it. That’s true of any writing. Success is in the tweaking. Linkedin is not going away. Because of its business orientation, it’s probably the most solid of the social media platforms. It’s not a fad. You’re going to have this branding platform for a long while to come. So see the time you put into it as an investment. Yes, there’s some work to do in the beginning, but once you have all the main bits done, it’ll become more a matter of checking in now and again. And once you become more advanced, it’s more about publishing content and reaching out. 36. Do a Linkedin course! Doing a live course somewhere will force you to sit down and do it! 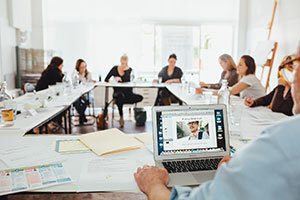 We offer one of those – a one-day Linkedin training course where we step you through how to use Linkedin (the above and more.) BYO laptop and login and we’ll get stuck in. It’s a dedicated day to get your Linkedin up and going. And to leave with a better understanding of how it works. With the time, we show examples and go into areas in more depth – including a whole lot more on how to use Linkedin strategically to find new business or new work. If you have any questions about the course or any of this you’re welcome to get in touch. And if I’ve left out anything important (that beginners need to know), by all means let me know – via the Comments below. Thanks Jules! If you have questions (about social media, Linkedin or the courses) at any stage you’re welcome to get in touch.